Was early crocodile a top predator among dinosaurs? It’s widely-accepted that dinosaur ruled the Earth (unless you believe that the Earth is only 6,000 years old and magically sprang into existence). For around 200 million, roarin’, stompin’, Jeff Goldblum-chasin’ years they were the unquestionable tyrants of the land. Or were they? Scientists from the US claim to have found an early ancestor of crocodiles which they believe could have been the apex predator in the region in which it lived, certainly bigger than any dinosaurs in the vicinity. Crocodiles (along with birds) are 2 families of animals, related to dinosaurs, which managed to survive the mass extinction event of 65 million years ago. They (like sharks of the land) have therefore evolved over millions of years to become perfect killing machines. But interestingly, this was not always the case – once upon a time, the ancestors of modern-day crocs were believed to be small, land-dwelling and primarily vegetarian (which is a bit like finding out Simon Cowell actually had a taste in music at some point in his youth). The ‘crocodylomorph’ discovered by the team of palaeontologists is described as ‘unusually large-bodied’ for its time period and could be one of the earliest examples of when crocs began to evolve to be bigger and bite-ier (which I promise is a real scientific word…). It is useful to understand how creatures have evolved in the past so we have a better idea of how and why their adaptations came about (i.e. what happened in their environment to make the change in their traits more helpful to their survival). Understanding this can be useful in today’s world where we need to understand how changing environments can affect ecosystems and how some organisms might adapt while others might require intervention in order to protect them. Plus dinosaurs are friggin’ awesome. 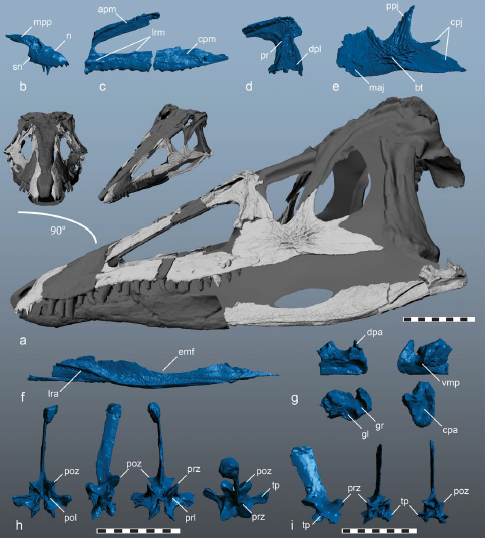 The researchers analysed a skull discovered in the Pekin formation (in modern day North Carolina) and compared it to other ‘crocodylomorph’ fossils to see where it fits in to the evolutionary jigsaw. Important things to consider were its age and how certain features on the skull were shaped. Features such as the teeth and shape of the jaw can help the researchers to make intelligent guesses as to how this individual creature lived, and by comparing features with other related crocodylomorphs they can guess as to how it evolved over time. The skull was around 231 million years old and more than 50cm long. The researchers calculated that it would likely have been around 3m long. Its teeth were ‘elongated, serrated and slightly recurved’, suggesting that it ate meat. Because of its size and carnivorous nature, the team named it ‘carnufex’ – meaning butcher. 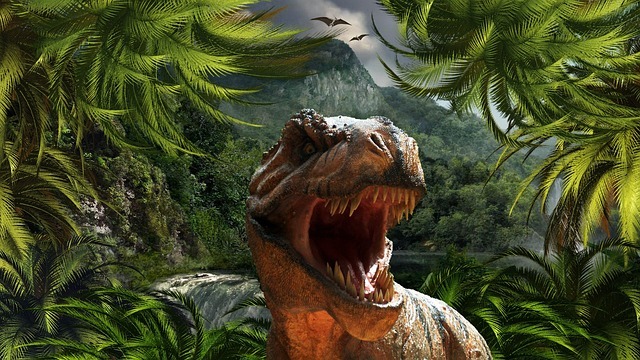 The team claims that meat-eating dinosaurs found in the same region and from that same time period were smaller than carnufex, which they say suggests it was a ‘top-order predator’. The researchers do make a compelling case, generally if something is larger than anything else around and eats meat then it is probably an apex predator (although it might also be a scavenger). The fact that it was larger than the dinosaurs of its era and location (dinosaurs in other regions at the same time grew bigger) raises an interesting possibility that at one point crocodiles were the predators of dinosaurs. 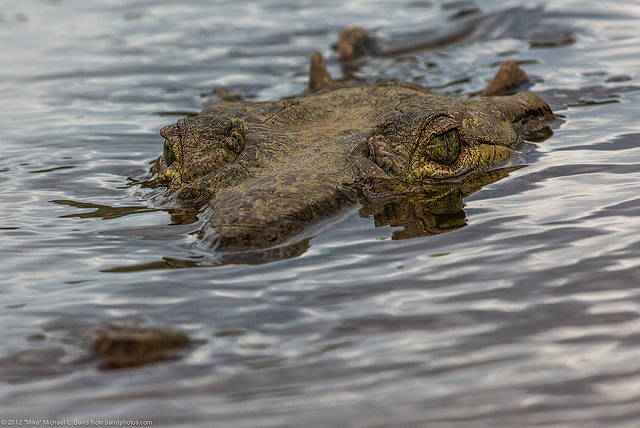 Given that we are (kind-of) predators of crocodiles (there are plenty of places that sell cutlets of croc), does this mean we are the most successful predators the planet has ever seen? Probably not – in a few million years the ancestors of lions or dolphins or even chipmunks might be lunching on us, so is the precariousness of evolutionary power. 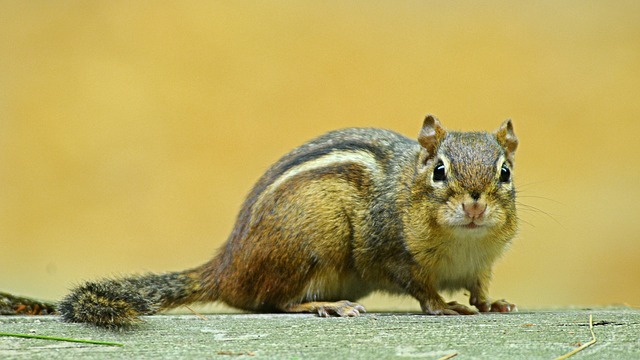 So perhaps we should view our time as the Earth’s dominant species for what it is in the grand passage of time – merely a passing fad – and try not to ruin it for the 7ft tall meat-eating apex-predator chipmunks of the post-apocalyptic future. All images are open-source/Creative Commons licence. Credit: AzDude (First); Mike Baird (Second); L Zanno et al. (Third); Fotocitizen (Fourth). Text © thisscienceiscrazy. If you want to use any of the writing or images featured in this article, please credit and link back to the original source as described HERE. What might aliens look like? If Star Trek is to be believed, they would mostly look like jobbing actors with plasticene on their faces. 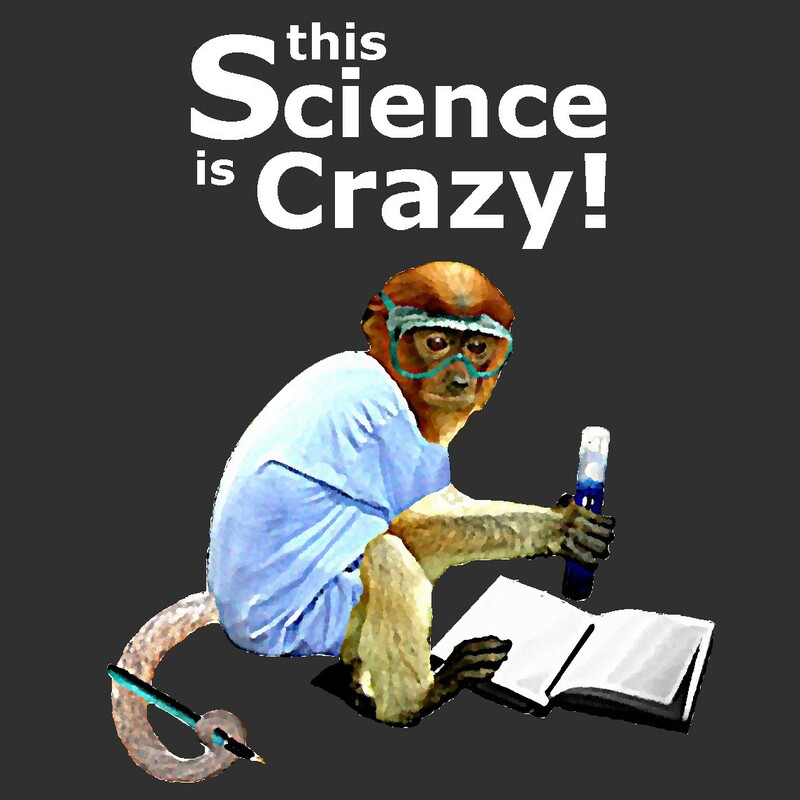 But the environment which enabled a warm-blooded, two-legged ape to become the alpha organism is very specific to Earth – a myriad of different creatures could evolve on planets with a different gravity, temperature and exposure to the sun. But what about chemistry? Life on Earth is built on long carbon chains (hence ‘carbon-based’ life), the only element known to form chains long enough to construct proteins, fats and sugars that form the physical building blocks of living cells on Earth. In addition, all of the physical and chemical interactions which occur to make life work (like extracting energy from sugars, sending electrical messages through your nerves) require a solvent – which on Earth happens to be water. So when scoping out planets that could potentially sustain life, scientists typically look for signatures of chemistry similar to Earth – water, oxygen and carbon dioxide. But perhaps life can be formed based on a different kind of chemistry, and a group of scientists from the US believe that in a methane (rather than water) sea, short nitrogen-carbon chains could form membranes with similar properties to the ones found in living things on Earth. Cells are basically just bags of fluid with biochemicals drifting around in them. The outside of the cell-bag is a flexible skin known as a membrane. The function of the membrane is to keep hold of things the cell wants to keep in and to let in and out thins that it wants to transfer (e.g. food in, waste out). Living things on Earth have membranes made from phospholipids (a type of fat), which are tadpole-shaped molecules. The ‘head’ of a phospholipid readily makes physical interactions with water molecules (hydrophilic), while the ‘tail’ does not (hydrophobic). This structure means that the tails will spontaneously clump together, while the heads remain in contact with the water – in other words, the phospholipids assemble themselves into a bilayer. The scientists wanted to see if there are molecules that can form bilayers (and therefore possibly alien cell membranes) in liquid methane rather than water. The reason for this is that in the solar system, the only other body with liquid oceans is Titan, a moon of Saturn, which has methane seas. It is possible that in the hunt for extraterrestrial life, we should be looking for places with methane seas as well as water-worlds (preferably those without Kevin Costner). The scientists first identified a group of molecules which exist in Titan’s atmosphere (identified by the Cassini orbiter) which they believed could form bilayers. 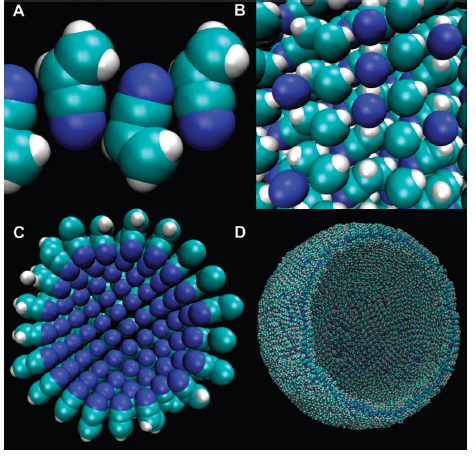 They then used a computer simulation to test whether or not a bilayer would form, and if so, what the structures of the molecules would be and how strongly they bind to one-another. They cross-checked the binding energies and structures predicted by their model with quantum mechanical calculations and chucked out the molecules where the calculations didn’t agree (as these were less reliable). They then used another model to estimate the flexibility of the membranes themselves. The model consists of a grid of molecules in a bilayer, with one of the central molecules slowly drawn out of the bilayer structure. As the molecule was drawn out, it draws others with it –and a flexible membrane will form a ‘rectangular pyramid’. The flexibility could be calculated from the size of the force required to generate a pyramid of a particular area. The scientists identified a group of molecules with short carbon chains and a nitrogen ‘head’ group. They named these molecules ‘azotosomes’. 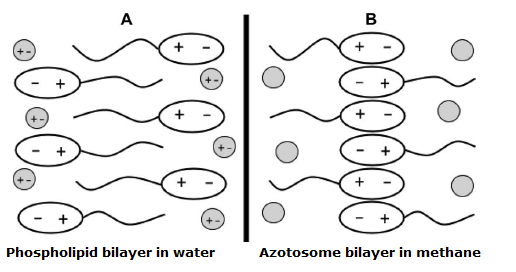 They found that several azotosomes which were predicted by the model to form bilayers in liquid methane, which had similar flexibilities to cell membranes. Acrylonitrile emerged as the most promising candidate – it was elastic, but had by far and away the strongest bonding energies out of the azotosomes. This study does suggest that ‘azotosomes’ might be capable of forming membranes in liquid methane, but the next obvious step is to test this in real life. The authors pointed out that there would be ‘challenges’ in doing their study at the cold (cryogenic) temperatures of liquid methane, but now that they have identified the best candidates for membrane formation, a real-life study would be able to focus on the molecules most likely to work. 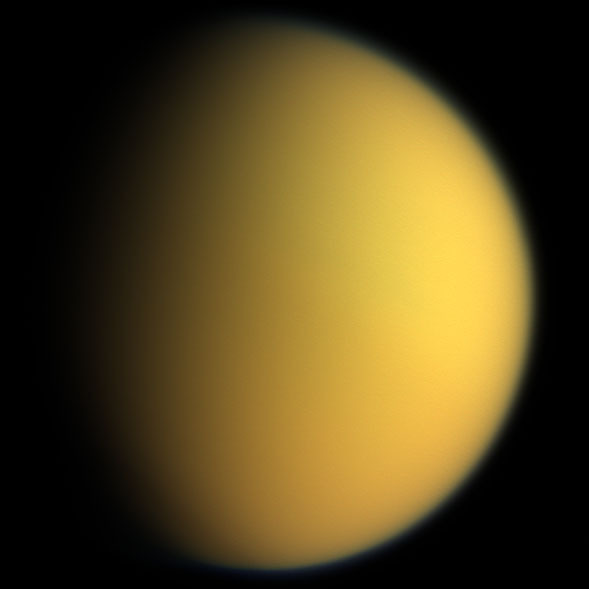 Of course, this study does not prove that life can evolve in the liquid methane seas of Titan, as the authors clearly point out, however it does suggest that a vital part of a living cell could in theory arise spontaneously on an alien world with a very different chemistry to what we have on Earth. This opens the door for a much more exciting approach to the search for alien life as worlds previously believed to be inhospitable could potentially harbour lifeforms that work with a different type of chemistry to ours. If this is indeed possible, then the universe just got a whole lot bigger. 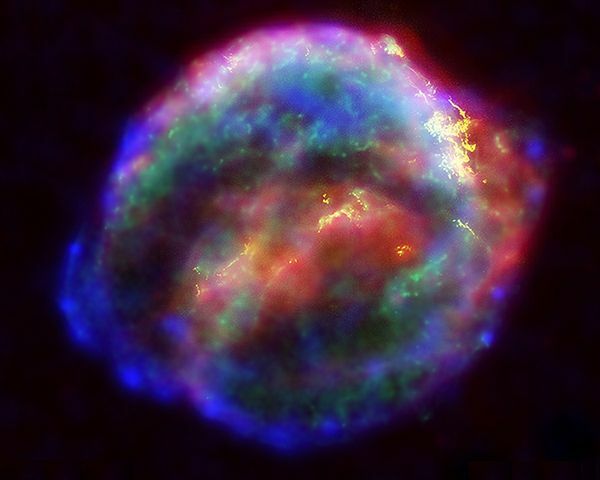 Cosmic rays are a form of radiation from space consisting of particles such as protons and atomic nuclei that are very high in energy. These particles have the ability to electrically-charge (ionise) water molecules in the Earth’s atmosphere. These water ions can act as the starting points (nucleation points) of clouds in the lower atmosphere, so these rays from space actually play a role in cloud formation and therefore climate. Weirdly, and for reasons still not understood, they only make a significant contribution to cloud formation in the lower parts of the atmosphere, not the middle and higher parts. This is important because the position of clouds in the atmosphere determines whether that region retains heat or loses it: Radiation from the Earth is reflected by high clouds more than by lower clouds, while the opposite is true for radiation from the Sun. 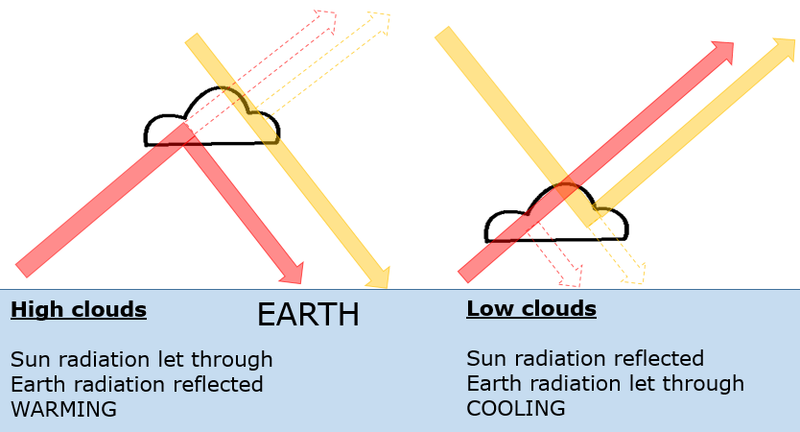 The overall effect is that more radiation reaches/is trapped on the Earth by high clouds than by low clouds, heating the Earth, while the opposite is true of low clouds. And because cosmic rays help with the formation of low clouds, the level of cosmic ray radiation received by the Earth could affect the global temperature. So a team of researchers from the US, UK and China have compared cosmic ray radiation and global temperatures to see if there is any link between the two. Understanding the effects of cosmic rays on the temperature could help us to better predict weather and climate. This is more important than just helping you to know whether or not to take an umbrella with you – accurate weather prediction can help nations and aid organisations to better prepare for extreme weather, minimising the human cost of cyclones and droughts. The statistical analysis can also help scientists to better understand climate change – to see whether cosmic rays have had an effect on the global temperatures rises of the past century. The researchers used a statistical analysis known as convergent cross-mapping (CCM). Rather than being a coming together of angry cartographers, CCM allows you to see how likely it is that one variable is the cause of another over time. They looked at both short term and long-term trends, to see if there was a causal link between cosmic rays and global temperature on short timescales (year-to-year) and on longer ones (across the last century). The researchers claim there is no significant causal link between cosmic rays and the long-term increase in global temperature (global warming). However, year-to-year, they noticed a ‘modest causal effect’. The researchers claim that cosmic rays are likely to affect the Earth’s temperature year to year, but not the global warming phenomenon observed over the past century (which they appeared very keen to stress). The idea that radiation that has travelled hundreds or thousands of light years can affect weather on Earth is pretty awesome though. One theory is that cosmic rays originate from supernovae (exploding giant stars), so next time it’s raining on you, rather than getting annoyed about your choice of footwear, just think that those clouds could have been formed by an unfathomably distant star as it died thousands of years ago in the most spectacular, violent and beautiful way imaginable. Mind blown. Who’d have thunk it? : Amorous horses, soothing lambs and mice that queue during an ‘evacuation’. Does a dog’s personality reflect that of its owner? Researchers from Hungary and Germany conducted a survey of around 1,500 dog owners, asking them about their dogs’ ‘separation behaviour’ and their own ‘attachment’. They found a correlation where dogs displayed more symptoms of ‘separation-related disorder’ (such as howling, destruction and trembling) if their owners described themselves more detached (e.g. less comfortable with intimacy and more anxious). 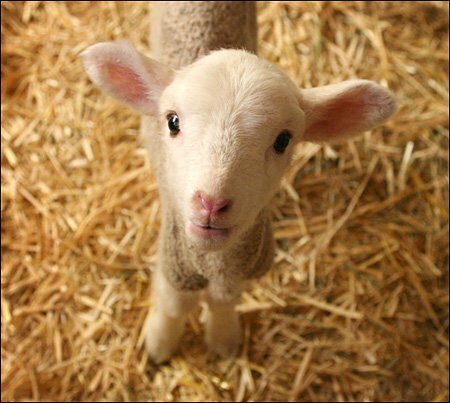 And it’s not just dogs who prefer attentive humans: Researchers from France claim that lambs have lower heart rates when gently stroked by human carers than when they are not. They also displayed other signs of ‘positive emotional states’ such as moving less and hanging their ears. 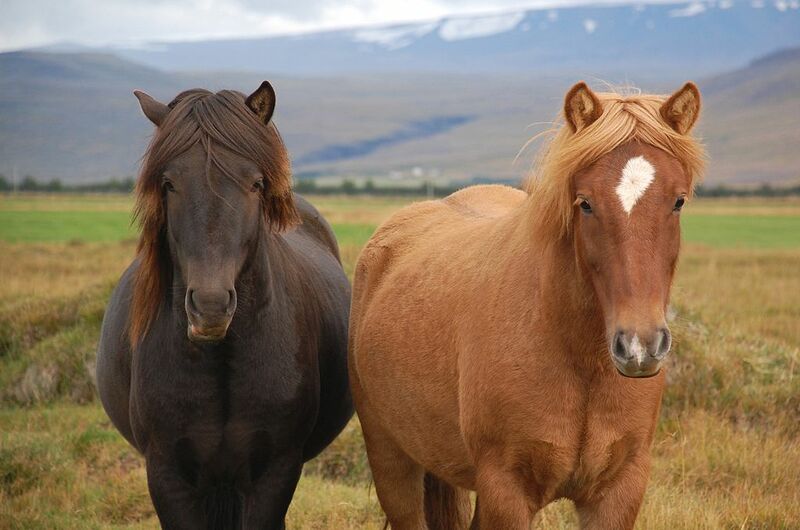 Sticking with the farmyard theme, it seem that female horses prefer the Barry Whites of the equine world: Researchers from France have shown a link between the depth of a male horses’ voices and their fertility – with mares apparently more attracted to speakers playing low-frequency male whinnies. From horses to horsepower: Our transport infrastructure is currently built on liquid fuels, which limits the usefulness of solar power. This could change, however, as US scientists have demonstrated a ‘hybrid’ device which is part machine and part living organisms. A photovoltaic cell and bacteria combine to perform the chemistry required to generate isopropanol from water, CO2 and sunlight. [Read the full TSIC article HERE]. Researchers from the Philippines claim that mice can queue during a simulated evacuation from a water pool. They tested groups of mice that had been trained as individuals to escape from the pool via one of two exits and those that hadn’t been trained, observing that the trained mice escaped quicker because they took shorter escape routes, didn’t block the exits and used ‘self-organised queuing’. And finally, with more mouse-survival news, scientists from the US and Turkey have genetically-engineered mice that are resistant to frostbite. They spliced in a gene from a tick that codes for a special glycoprotein, which prevents ice crystals from growing and damaging cells. [Read full TSIC article HERE]. Credit: PicturePerfect96 (First); Edwardwexler (Second); Kapa65 (Third and Title). The chilling spectre of winter has fallen upon those of us in the higher latitudes of the Northern Hemisphere, and we humans are fortunate enough to have a number of ways of coping with the cold. But for creatures that don’t have electric heaters, hot chocolate and fleece onesies, there are many ways to survive the frigid hibernal months: extra fur, blubber and hibernation are some of the more well-known tactics. Some creatures even have the ability to let themselves freeze solid (like a Martian Ice Warrior, or Walt Disney) by replacing some of the water in their cells with sugar and urea (the smelly substance in urine). This prevents ice crystals from growing into the cells and disrupting their outer membranes (which would kill them). A team of scientists from the US and Turkey discovered a species of tick which uses a similar method – except using a special sugar-protein (glycoprotein) to prevent the growth of ice crystals. In a recent study, they genetically engineered mice to produce this glycoprotein themselves to see if it could make them more resistant to frostbite. The research team wanted to see if the glycoprotein could help to prevent cold damage in mammals. If it works, it could be of benefit not only to frostbite victims but also in organ transplants, where the donor organ is typically kept cold during transport – the glycoprotein could help to reduce damage to the organ, making it more likely to function in the patient. 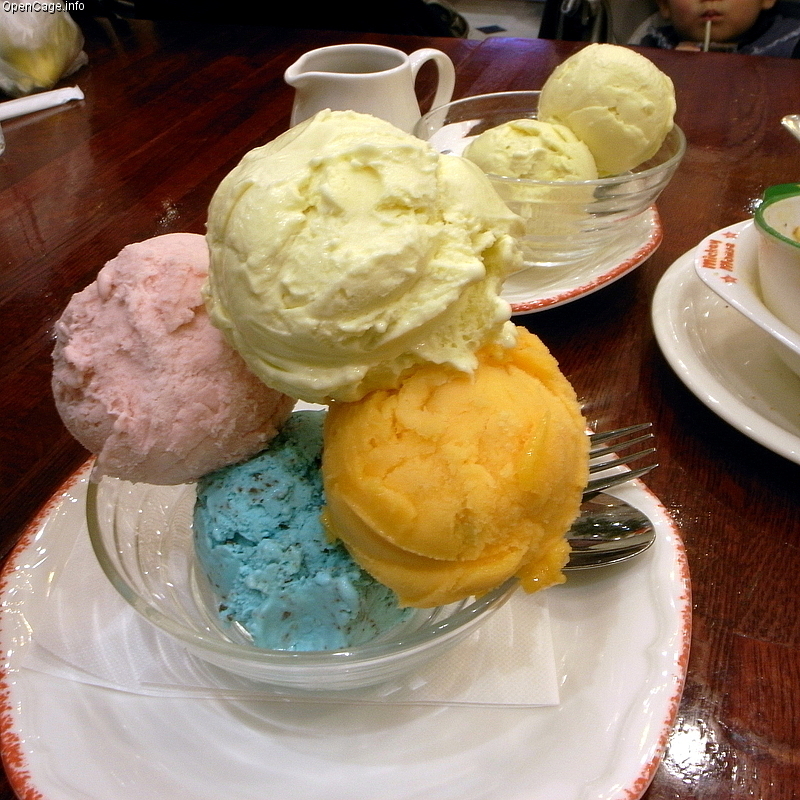 Perhaps more importantly, antifreeze proteins could be used in ice-cream! Unilever are apparently investigating the use of a similar protein to help stabilise ice-cream when the fat content is reduced, meaning that it could reduce the number of calories (and we can therefore eat more!). First, the scientists inserted the glycoprotein gene into the genome of a group of mice to give them the ability to generate the glycoprotein themselves. They then interbred the mice for 8 generations to the point where the entire group of mice could make the glycoprotein (mice homozygous for the glycoprotein gene). They then compared the transgenic (i.e. genetically modified) mice with a group of regular, ‘wild type’ mice via a series of tests. First, they removed some skin cells from the two sets of mice and subjected them to extreme cold before observing the response. They then dipped the tails of around 100 mice into a bath at -22oC and looked for symptoms of necrosis (tissue death). They also took sample of the tails and looked for several other signs of frostbite, including auto-amputation (tail falling off), cell ‘stress’ chemicals (cytokines) and immune-system response. The scientists found that the cells from the ‘wild type’ mice didn’t multiply, but the cells from the transgenic mice did. This suggests that the individual cells are more resistant to cold-damage if they can produce the glycoprotein. 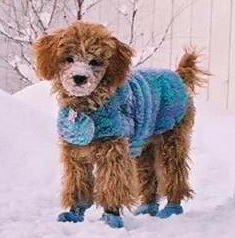 The tail-dipping experiment was to see if the frostbite-resistance could scale up to the level of the organism. The researchers claimed that 89% of the ‘wild type’ mice showed signs of frostbite, but only 40% of the transgenic mice did, suggesting that the glycoprotein confers frostbite resistance to a living organism as well as a handful of individual cells. 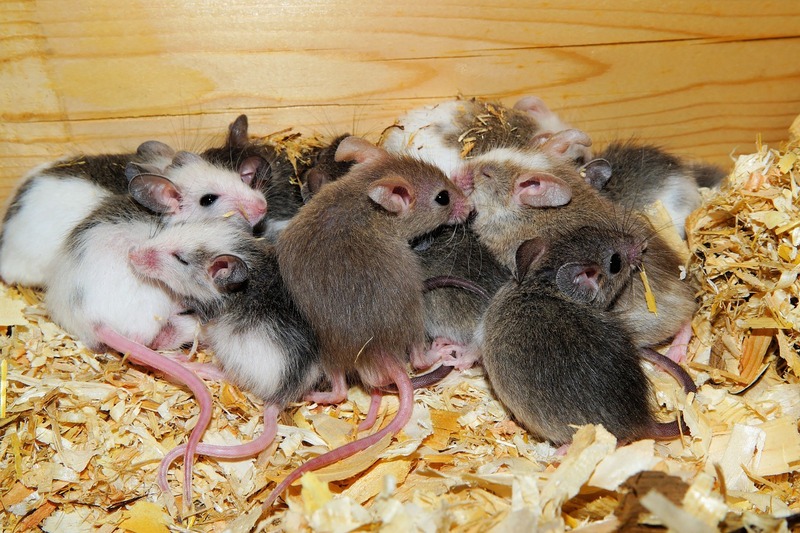 It appears that their experiments worked – symptoms of frostbite seem to occur less often in the transgenic mice than the ‘wild type’. Importantly, they used a battery of tests to look at the differences between the two groups, investigating response of the tissue as a whole, the cells comprising it and the immune response. Now that they have shown that the glycoprotein can help reduce cold damage in a mammal, it would be interesting to see if it can help to make cold-stored transplant organs more viable. Helping patients with frostbite may be a bit trickier as it might have to be used as a preventative method rather than a treatment for someone who is already frostbitten (e.g. a mountain-climber injects themselves with the glycoprotein before they go out in the cold). So while glycoproteins like these are never likely to be used by rodent polar explorers, they could one day help save the lives of critically ill people – and also change the world of ice-cream forever! Credit: SlimVirgin (First); opencage.info (Second); Tomi Tapio K (Third and Title). When we think of ‘memory’ we typically think of the brain being able to recall facts and events, but ‘memory’ can take other forms: some plastics can ‘remember’ particular shapes, material shapes or magnetic alignment can be used for storing digital data and our immune systems also have a capacity to ‘remember’ past infections. Bacteria are also believed to display a kind of ‘memory’ too, which helps them to digest nutrients they have encountered recently. 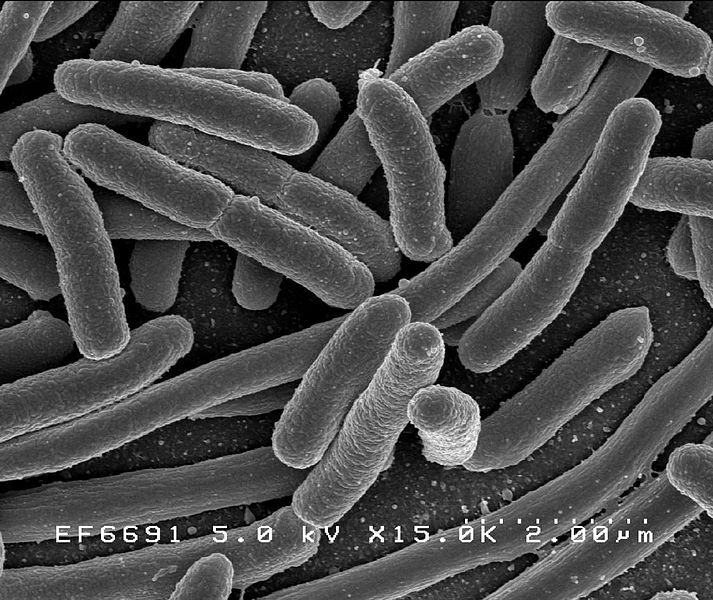 A new study by researchers in the US explores this ‘memory’ in E. coli to see how it impacts on their ability to grow in environments where the food source changes. Bacteria are hardy survivors – the Mad Max of organisms. They are thought to be one of the very first forms of life to have evolved, and will certainly be around long after humans have gone (in fact, they’ll almost certainly have eaten our physical remains). Central to their incredible capacity to survive is their ability to eat different things. 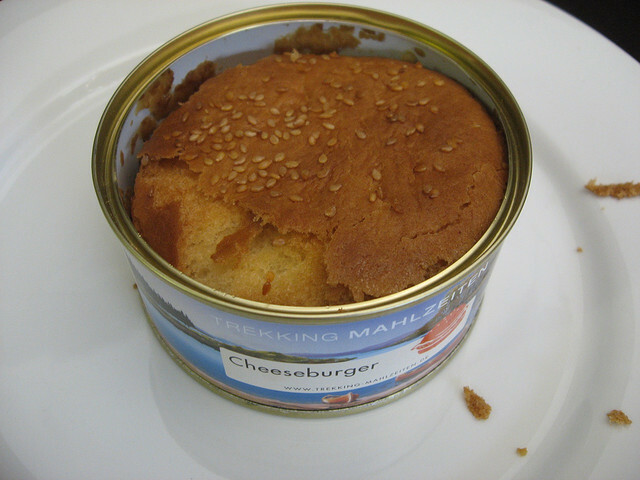 Now while this might not seem particularly impressive to us – a species that invented the bacon ice-cream sundae or the cheeseburger in a can – species of bacteria have evolved to eat substances as unappetising as concrete, petroleum and nuclear waste (although no peer-reviewed tests have been conducted to see if any can eat the cheeseburger in a can). 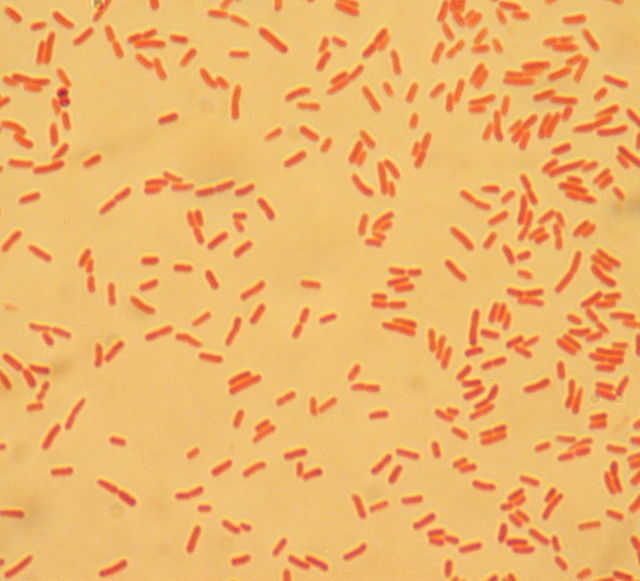 When a bacterium is exposed to a new food source, it typically takes a while to become adjusted to it (the so-called ‘lag phase’). In this phase, the bacterium is generating the biochemical machinery (enzymes etc.) needed to digest the new nutrients it finds itself surrounded by. During the ‘lag phase’ the bacteria are not dividing and so growth of the bacterial population is temporarily stunted. The researchers wanted to see if bacteria could, in effect, be trained to grow on more than one food source and reduce or eliminate the ‘lag phase’. This idea is not completely crazy – the authors claim that ‘memory’ has been previously observed in bacteria, as some of the metabolic machinery for the original food source will still kick around inside the cell even after the bacterium has adjusted to the new food source. Figuring out whether or not bacterial ‘memory’ helps them to quickly adapt to changing environments could be important in understanding how to control the growth and spread of bacteria. This is not just useful for killing harmful bacteria that we don’t want, but also for culturing or harvesting bacteria that we do want, for instance those used in waste treatment or for producing therapeutic molecules such as human insulin. The researchers developed a microfluidic device, which fed a culture of bacteria (E. Coli) a stream of either glucose or lactose, with the feed changing every 4 hours for 3 complete glucose/lactose cycles (24 hours in total). As the feed flows past the culture, individual bacteria are washed away, and are measured at a point downstream. The number of bacteria washed away in the stream is used as an indication of the total size of the population. In a second experiment, they tested how long this ‘memory’ persists by growing bacteria on lactose for four hours, switching to glucose for a varying time (4, 5.5, 7, 9 and 12 hours) then measuring the ‘lag phase’ (if any) when the feed was switched back to lactose. The first time lactose was introduced (after 4 hours of glucose), there was a significant ‘lag phase’ as the bacteria adjusted to the new food (see Graph A below). However, the next time glucose was introduced, the ‘lag phase’ was much shorter and in subsequent changes of glucose/lactose there was no ‘lag phase’ at all, with the transitions described as ‘seamless’ (see Graph B below). 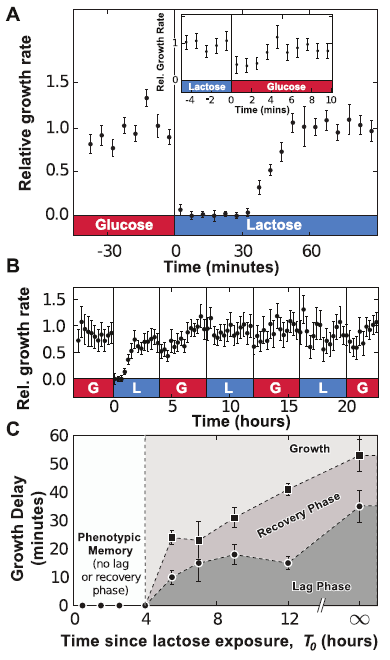 However, in the second experiment where the exposure time to glucose was varied, they found that when the bacteria were deprived of lactose for longer than four hours, the ‘lag phase’ reappeared. The ‘lag phase’ generally increased as the time away from lactose increased (see Graph C above). In further tests, they looked at the lactose-digesting machinery (specifically proteins known as LacY and LacZ). They stated that LacY and LacZ are degraded extremely slowly, so this alone is unlikely to be the cause of the increase in ‘lag phase’. However, they reckoned that LacY and LacZ are passed on from mother cell to daughter cell as each bacterium divides, causing ‘dilution’ of these proteins in each resulting cell (all of the residual LacY/LacZ of the mother cell would be shared between mother and daughter after division). This can explain why there is little change in the length of the ‘lag phase’ at lactose-deprivation times below 4 hours (not much cell division occurs), but above this time there is a general increase in the ‘lag-phase’ as the number of cells dividing increases with time (sharing roughly the same amount of LacY and LacZ between a larger number of cells). There certainly appears to be a link between the length of time since the bacteria were exposed to lactose and the length of the ‘lag phase’, and the reasoning that cell-division is responsible appears to be consistent with the results. This study could help scientists to better understand the mechanisms behind the growth behaviour of bacteria – important information in trying to control them. This is essential for harnessing their incredible capabilities technologically and curtailling their potential to harm us too. Algae are aquatic organisms which make ponds murky and biofoul the hulls of boats and ships and slow them down. But these these tiny green creatures could also be the future of fuel production – they produce natural oils (lipids) which can be extracted and turned into a wide range of hydrocarbon fuels including diesel and kerosene. 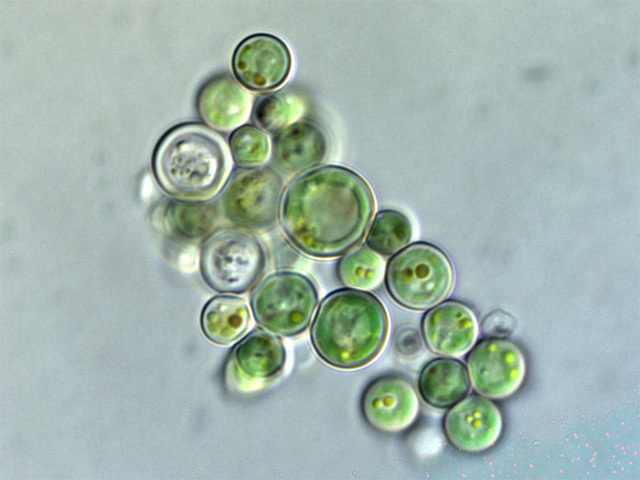 Finding ways of growing the algae as efficiently as possible is essential for this technology to become commercially viable, and developing photobioreactors (basically glorified jars of algae) which can maximise the amount of sunlight that the algae receive is an important part of improving this efficiency. A team of researchers from the US has investigated using a quirk of light exploited in fibre-optics to improve the distribution of light in an algae tank and boost growth. This study uses Slab waveguides, which exploit a phenomenon known as ‘total internal reflection‘, where light waves are trapped inside an object, continually bouncing off the inside edges (see images above). Total internal reflection allows a light wave to be guided in a similar way to how a pipe or hose guides a flow of water, and is used in applications such as fibre-optics. Here, the researchers wanted to use the phenomenon to guide some of the incoming sunlight into the darker parts of the algae tank, where it doesn’t usually penetrate. While the researchers say that using waveguides to scatter light in photobioreactors has been done before, this study tests different scattering schemes in order to distribute light as evenly as possible throughout the tank. By making the distribution of light as even as possible, it will hopefully improve the growth rate of algae and therefore produce biofuel more efficiently. 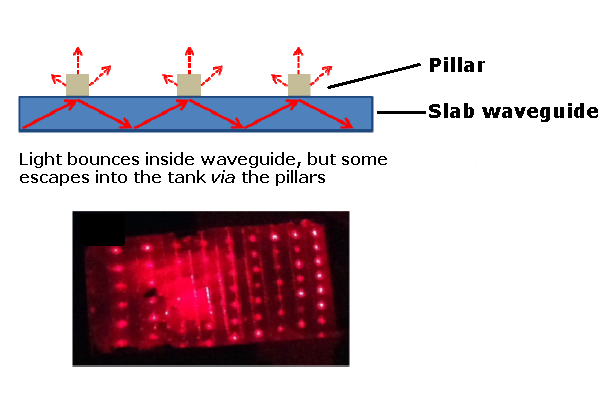 In order to make the light leave the slab waveguide, the researchers attached tiny pillars designed to scatter some of the light from the waveguide, distributing it into the tanks (see image below). The waveguide/pillar system effectively turns incoming sunlight (which would normally only light up the outer surface of the algae tanks) into a series of small lights which can be spread evenly throughout the inside of the tank. However, because light is being removed from the waveguide by each pillar, the intensity of the light is much lower at the end of the waveguide than it is at the start. So the researchers wanted to see if they could vary the distances between the pillars in order to compensate for this by having pillars more spread out at the beginning and more concentrated at the end (‘gradient’ system, see image below). 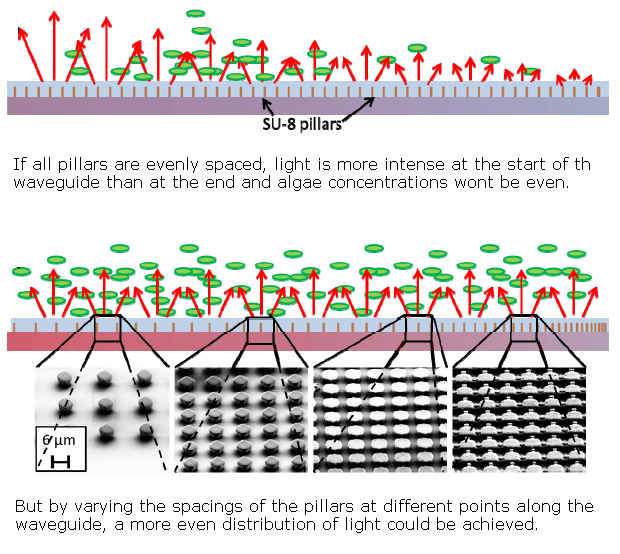 In an experiment using dye-stained water (to imitate a thick biofilm), the researchers found that their ‘gradient’ pillar system successfully distributed light of roughly the same intensity across the length of the waveguide. They then tested their system in a thin bioreactor against a similar system with evenly-distributed pillars. Crucially, they found that by changing the spacings between the pillars (more spread out at the start of the waveguide) boosted algae growth by ‘at least 40%’. It seems as if their idea has worked – the ‘gradient’ pillar scheme appears to distribute light evenly across the tank and led to an increase in algae growth compared to the evenly-distributed pillar scheme. This is a simple, but quite clever, engineering solution to the problem of enabling sunlight to penetrate into a tank of algae and could help large-scale algae biofuel-production to become a reality one day. 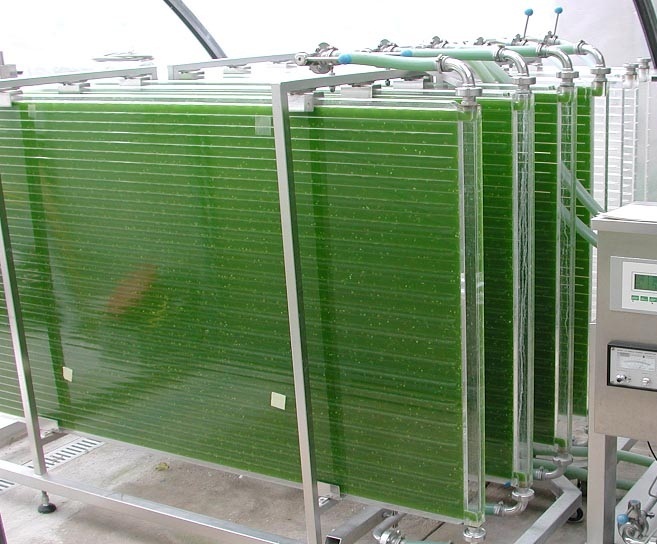 There is also potential to use waveguides to collect light that would normally fall outside the tank, boosting the overall amount of light available for the algae. It may be a while before algae are helping us to drive around, but research like this adds another piece to the jigsaw that could help the dream of green fuels become realised.